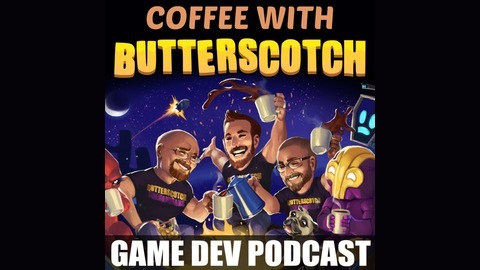 Coffee with Butterscotch is the hilarity-filled official podcast of award-winning video game studio Butterscotch Shenanigans. Tune in every week to learn how video games are made and sold, our take on building a small company from scratch, and how to be an unstoppable problem-solving machine. Whether you're a tech entrepreneur working on your own startup, a person who loves playing or making video games, or just a person interested in learning about the games industry, we've got you covered. 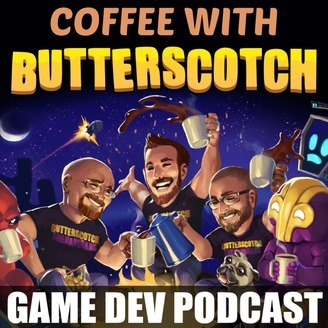 Butterscotch Shenanigans is an independent video game studio best known for its smash hit Crashlands. The podcast features founders Seth Coster (the games programmer), Adam Coster (the web programmer), Sam Coster (the artist), and other awesome people. Got a question you want answered on the podcast? Ask at http://podcast.bscotch.net. [Ep200] Levelhead EA Launch Day Minisode! Surprise, Shenanites! LEVELHEAD IS NOW AVAILABLE IN EARLY ACCESS ON STEAM! In this episode, we talk about what even is this, the background of Levelhead, and pro tips from the alpha strike team. So, shout it from the rooftops! From the street! Shout it directly into the face of your neighbor! (Don’t actually do that -- it’s kind of rude. Unless they’re into it.) But most importantly, check out our new game! (http://bit.ly/2IFd0ZQ) Exclamation points!!! Questions answered (abbreviated): - lekiy: What are your thoughts on Difficulty Options in games? Is it preferred to give players the option to tailor their own experiences, or to have one difficulty that is well-tuned by the devs? - Dangpak Packawoo: With Levelhead being your new game and Crashlands fading into the background, how do you feel? Is it hard to see something you worked so long on slowly fall out of the limelight? - challosis: Have you tried turning it off and on again? - Zivix: Do any of you have a favorite level archetype going into Levelhead Early Access? To stay up to date with all of our buttery goodness subscribe to the podcast on Apple podcasts (apple.co/1LxNEnk). If you want to get more involved in the Butterscotch community, hop into our DISCORD server at discord.gg/bscotch and say hello! Submit questions at https://www.bscotch.net/podcast, disclose all of your secrets to podcast@bscotch.net, and send letters, gifts, and tasty treats to http://bit.ly/bscotchmailbox. Finally, if you’d like to support the show and buy some coffee FOR Butterscotch, head over to http://moneygrab.bscotch.net.